JOLIET, Ill. – You could see it coming from a mile-and-a-half away. 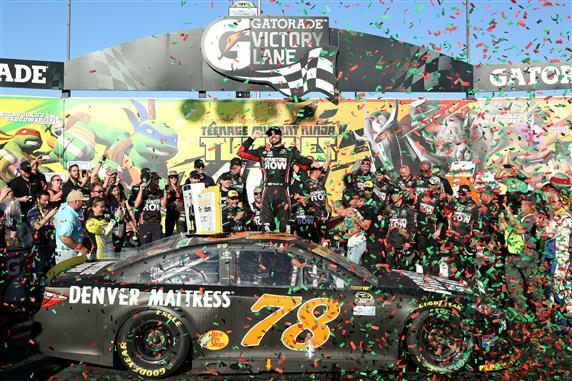 On new tires, Martin Truex Jr. rocketed around the outside lane after a restart in overtime at Chicagoland Speedway and pulled away to win Sunday’s Teenage Mutant Ninja Turtles 400, the opening race in the Chase for the NASCAR Sprint Cup. With the victory—his first at the 1.5-mile track, his third of the season and the sixth of his career—Truex also rocketed into the Chase’s Round of 12. But Truex wasn’t satisfied with a ticket into the next round and the prospect of racing stress-free at New Hampshire and Dover, the final two Round of 16 events. Truex lost a lap during an unscheduled pit stop on Lap 69 of 270 to change a flat right front tire, but he returned to the lead lap as the highest-scored lapped car when NASCAR called the second caution of the race on Lap 120 for Brian Scott’s spin off Turn 4. The driver of the No. 78 Furniture Row Toyota, who led 30 laps in the early going, didn’t regain the top spot until the restart in overtime on Lap 269, when he restarted fourth in the top lane and quickly dispatched Ryan Blaney, Kasey Kahne and Carl Edwards, who had stayed out on old tires under the final caution, called on Lap 263 when Michael McDowell shredded his right front tire. Joey Logano came from sixth to second in the two-lap overtime, trailing Truex at the stripe by .776 seconds. Chase Elliott won a drag race for third against fellow Sunoco Rookie of the Year candidate Blaney, with Brad Keselowski crossing the finish line in fifth. But for a lightning-fast pit stop that got Truex off pit road ahead of Elliott on the final stop, the outcome might have been markedly different. Elliott had held a one-second lead with four of 267 scheduled laps left before McDowell’s tire problem slowed the field and put the race in the hands of the pit crews. While Truex restarted in overtime on the outside of the second row with a clear lane to the front, Elliott took the green in fifth, boxed in at the bottom of the track. “That’s just part of it,” Elliott of the late caution that perhaps deprived the driver of the No. 24 Hendrick Motorsports Chevrolet of his first victory. “You’ve got to expect it and be able to embrace it and move forward. I feel like we did a good job controlling the things that we could control today. Elliott can console himself with the knowledge that other Chase drivers had far more serious issues. Kevin Harvick, the 2014 series champion, was trapped a lap down on pit road—by roughly two feet—when a runaway tire from Aric Almirola’s car forced the first caution on Lap 49. Harvick never got the lap back and finished 20th. He leaves Chicagoland 14th in the Chase standings and in danger of elimination from the playoff after the Oct. 1 race at Dover, where the Chase will be pared to 12 drivers. Jimmie Johnson led a race-high 118 laps but finished 12th after serving a pass-through penalty for a pit road speeding infraction on Lap 234. Rookie Chris Buescher struggled to a 28th-place finish in an ill-handling car and heads to New Hampshire 16th in the standings, with his prospects of advancing to the Round of 12 significantly dimmed. Kyle Larson was forced to pit road on Lap 260 with a tire deflating, finished 18th and is 15th in the Chase standings. Harvick, Buescher and Larson aside, Chase drivers held serve, taking 13 of the top 16 finishing positions. The only exceptions were Blaney, seventh-place Kasey Kahne and 10th-place Alex Bowman, who in relief of sidelined Dale Earnhardt Jr. scored the first top 10 with the No. 88 Chevrolet since Earnhardt ran second at Pocono in early June. Note: Both Truex’s winning car and Johnson’s 12th-place car failed the laser inspection station post-race. Since both failed by a slight margin, NASCAR officials said the infraction to the No. 78 Camry didn’t rise to the level of an encumbered victory. Consequently, Truex’s advancement to the Round of 12 stands. If penalties to either team are warranted, they will be announced later this week.